Fruits and vegetables are essential to a healthy diet. Yet, only a tenth of people consume enough of them. Regardless of the way you choose to eat your vegetables, what’s most important is making sure they’re a part of your diet. Both juicing and eating raw vegetables have important pros and cons. According to the Centers for Disease Control, people should consume 2 to 3 cups of vegetables per day. Eating fruits and vegetables is essential for a healthy diet. However, if you're like most people, you may not be meeting your daily recommendations. Juicing can be a tasty and convenient alternative to help you get the nutrition you need. While you may tend to think of juicing only fruits, you can also juice cucumbers or leafy greens like kale and spinach. Juicing can be a healthy way to enhance your vegetable consumption, as long as it’s not the only way you’re consuming your vegetables. Juiced vegetables are beneficial mainly because you’re consuming raw food products. When you bake, boil, pickle or stew, you can lose antioxidants and other nutrients. A 2016 study in the Journal of Current Research in Nutrition and Food Science showed that vegetables like beetroot typically lose nutrients when pickled or cooked, meaning that raw beetroot and beetroot juice helps you get more of what your body needs for good health. 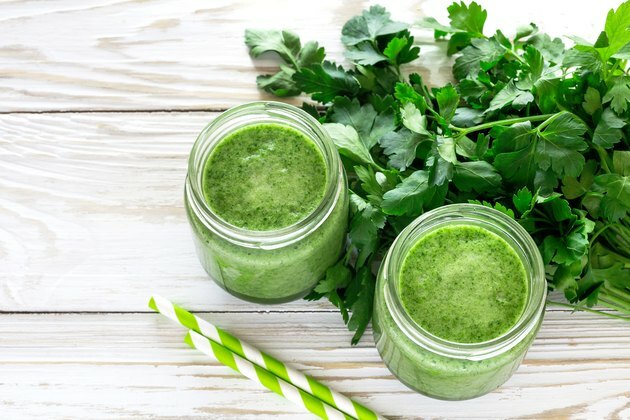 Juicing for health reasons can allow you to get the nutrients you need if you're following a liquid diet for medical reasons, such as gastrointestinal issues or you just had your wisdom teeth removed. Juicing has its downsides as well as its benefits. If you purchase juices rather than make them yourself, your juiced vegetables may also end up containing sugars or other additives. Extra sugars can turn otherwise healthy juices into unhealthy beverages. Raw vegetables, even when cut up in prepackaged snacks or salads, are unlikely to have any such additives. Another downside is that when you juice vegetables, you obtain only liquids. This means that the skin, and consequently the fibrous part of these foods, is lost in the juicing process. Fiber is important for the function of your digestive system and helps regulate your blood sugar. When you eat raw vegetables, you get the beneficial fiber and all the other health-promoting nutrients. The fiber in whole food products can also help you feel full. If you’re consuming only a liquid diet, you may consume more calories, simply because liquids may not be as satisfying as whole foods. If you’re keen on getting a meal in while on the go or are trying to lose weight, fibrous, raw vegetables are much better for you than juiced ones. As an alternative, you can always try putting your vegetables into smoothies. This way, you can obtain more nutrients and fiber and still have the convenience of a drinkable product. Does Juicing Vegetables Give You the Same Nutrition?